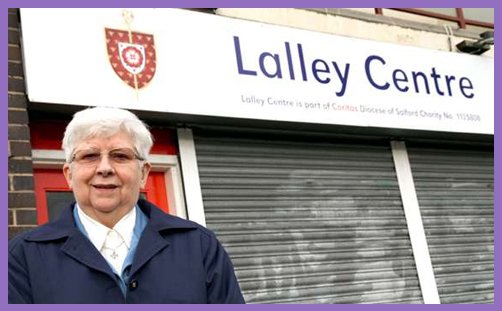 If you need any insight into the realities faced when running a foodbank, look no further than the Lalley Centre as featured on Sister Rita to the Rescue all last week on BBC1. Sister Rita, the nun who ‘stars’ in this five-part series, runs the centre based in Collyhurst, Manchester, which is recognised as one of the most deprived areas in the country. It is funded by the Roman Catholic charity Caritas, and thanks to the no-nonsense approach of Sister Rita, it is clearly doing an outstanding job bringing in food donations from local suppliers and retailers and dishing them out as fairly as possible to those who turn up on the doorstep in need of help. Sister Rita is also responsible for Iain Duncan Smith trialling the placement of Job Centre staff in foodbanks, following a meeting with him in London this summer. If anyone doubts that the repeated messages from those on the ground running foodbanks about the way that benefit changes and sanctions are leaving many in a precarious state of vulnerability have been noticed by those in government, then the case of Sister Rita proves otherwise. Whether it was some Catholic resonance or Sister Rita’s charm, the response from IDS was immediate, and within weeks an advisor was visiting the Lalley with the authority to overturn sanctions if they deemed they had been imposed unfairly. Some may see Iain Duncan Smith as a heartless ogre, but despite stating she had no great love for this government, Sister Rita was impressed by the man she met. This is one of the great frustrations of the entire situation regarding hunger and food poverty in the UK. It is undoubtedly an issue affecting a significant proportion of our population, but as it has increasingly become a political football over recent years, separating fact from half-truth or non-truth has become difficult. During the first episode of ‘Sister Rita’, the narrator states that an estimated one million people have used foodbanks. This is most likely taken from the Trussell Trust who say they fed 1,084,604 people nationwide through its network of over 400 foodbanks in 2014-15. It might make for an attention-grabbing headline, but it is also misleading and their website explains why if you dig deep enough. That figure refers to handouts and not unique users. We simply don’t know how many of these are repeat visitors because until now this data hasn’t been collected. Nor do we have any idea how the number of people in this country going to bed hungry has changed over the years because, again, this has never been measured. Sister Rita’s explanation for the increased use of her foodbank since it opened seven years ago is simply the news spreading by word of mouth. The number of residents in Collyhurst struggling to make ends meet has been high for a lot longer than that. The closest we can hope to get to an accurate picture of the UK-wide problem is to examine the picture painted in the Feeding Britain in 2015-16 report presented by the All-Party Parliamentary Group on Hunger and the Archbishop of Canterbury Justin Welby. This is a document loaded with facts, figures, analysis, criticisms and a hefty list of 68 recommendations. It also paints a somewhat unfamiliar picture of the landscape. It sees foodbank use beginning to fall nationally; that fewer benefit claimants are receiving delays in payments or sanctions, and that the situation should further improve as other government strategies currently in the pipeline begin to take effect. The benefits system is still far from perfect, with far too many being penalised unnecessarily, but this report finds plenty to praise the government for alongside the more expected points of criticism. Blame for the causes of hunger is spread across a complex and wide array of situations: alongside welfare payments being withheld, supermarkets are shamed for disposing of hundreds of thousands of tons of perfectly edible food each year which could be put to much better use – ie feeding the hungry. Energy companies are criticised too for penalising those on low incomes. And many of those asking for food handouts are shown to be lacking in basic budgeting skills, making their situation worse through poor lifestyle choices. One of the most striking statistics of the report focuses on smoking. It cites research which establishes that alongside the 2.3 million children classed as living in poverty due to parental income, an additional 432,000 are drawn into that bracket due to the costs incurred by their parents’ smoking. In total, it is estimated that 1.5 million children are living in circumstances of severe financial deprivation which is exacerbated by parental smoking. So the glaring and uncomfortable conclusion is that government intervention to fix the problems is never going to be enough: hunger and poverty will remain with us. and, like the poor, foodbanks will always be with us. But they could be far more than a temporary sticking plaster if they develop the operational model described in the report as ‘Food Bank Plus’, where they host trained welfare officers and other professional assessors and pastoral facilitators to allow the causes of poverty to be better addressed. The good news is that this is increasingly happening, and the results are impressive. 65 per cent of those helped by a welfare rights officer during their first visit to Birkenhead’s main foodbank were able to resolve their problems there and then, meaning they no longer had to rely on emergency food parcels. As it stands, the drive behind this particular movement to tackle poverty is firmly in the hands of Christians. The overwhelming majority of foodbanks are run by churches and Christian organisations. The Trussell Trust alone has 42,000 volunteers working at its centres. At least half of the authors of Feeding Britain are Christians, and it was funded by a donation from the Archbishop of Canterbury’s Charitable Trust. This ought to come as no surprise, given the Bible’s consistent exhortation to serve the poor and fight injustice. But the Bible also has plenty to say about truth and tough love. Poverty is an acutely political issue. 47 Bishops and 600 church leaders wrote to the government last year demanding action on the food poverty ‘crisis’, but there is a growing realisation that bashing the government has limited impact. Antagonism (from all sides) needs to be replaced with a genuine desire to work together to support, offer advice and then tackle some difficult cultural and ingrained habits of those requiring assistance. And we also need organisations such as the Trussell Trust to be honest in the ‘facts’ they present and the evidence-based rigour and reliability of their research. Foodbanks are a response to a dire situation, and very many people have reason to be thankful for all that they do. But they are only a start and not the solution. If they are going to be able to make a lasting impression in the alleviation of poverty, we need plenty of Sister Ritas with soft hearts full of compassion, but also hard heads that see the truth of the situation and know which battles to fight.